This is the online collection of William Ames. A graduate of Penn State University, Mr. Ames has a BA in English with an emphasis on Western Poetry. Mr. Ames lives and works in State College, Pennsylvania, and does freelance photography in addition to his staff position with the university. In his spare time, hiking, travel and photography inspire a number of subjects and themes. “Beneath the Shadow of Old Main” is in the editing process and will be available in late 2009. Look for it on Amazon.com and other booksellers. We will post more information as the publishing date approaches. The Discussion Forum is always available for your comments and critiques. A small town at the very center of Pennsylvania, State College owes most of its culture to Penn State University, for which it derives its name. 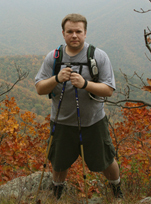 Mr. Ames is a member of the Modern Language Association and a Life Member of the Penn State Alumni Association.